While some cats do love receiving touch and attention from visitors, not all felines are social butterflies. If you sense that your cat becomes stressed or fearful when people enter your home, try creating an environment where he feels extra safe and protected. Remember, hiding isn’t necessarily a bad thing – it’s simply your cats way of self-soothing and protecting. 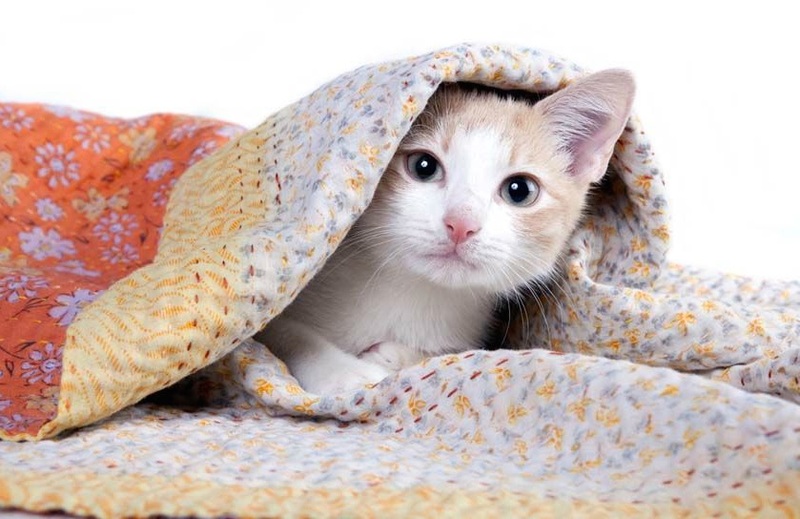 Setting your furry friend up with plenty of spaces to tuck under, climb over, and nestle into can ease your kitty’s anxiety and eventually provide the safety and reassurance he needs to venture out and meet your friends. Socializing your cat while he’s young is the best way to make him feel at ease in the presence of guests. One trick worth trying is having your visitors spray themselves with a pheromone (LINK) spray before entering your home — this may help calm your cat. Positive reinforcement is also your best friend here – you can offer your kitty a special treat like canned tuna only when guests are over. Once your cat becomes comfortable enough around company, you can engage in a fun game that you know your kitty loves, like chasing a razor. A tip: make sure your kitty already feels comfortable in the room or area where company usually hangs out. The more play sessions you do in that space, the more likely your cat will feel relaxed enough to linger once friends are over. Once your cat shows interest in your visitors, have them sit on a couch or chair, turned away from the cat, and instruct them to ignore your four-legged-friend so as not to appear threatening. With time, and as your kitty grows more comfortable, you may find him cautiously approaching your guests or even requesting a pet – just make sure it’s always on your kitty’s terms. Do you have a shy or fearful cat? How do you make he/she feel comfortable with guests? Please feel free to share your experience in comment section!